Remember when I made this quiche? Well, I ended up with quite a bit of leftover dough, and it seemed like a shame to throw it away, considering all the butter effort and more butter time that went into it - Julia Child's pastry dough should not go wasted! So I rolled the scraps into a ball and stuck it in the freezer, figuring I could use it for something else later. A few days later, I found myself with an excess of fresh pears, and decided to use the pastry dough to make some small pear tarts. I didn't want any fussy shaping or blind baking, so I decided to go with rustic free-form galettes, which don't require a special pan and could easily be made into a customized size based on how much dough I had. I also decided to add honey, dried fruit (cranberries and raisins), and nuts to the pear filling, inspired by a baked apple recipe from Around My French Table that I recently tried. 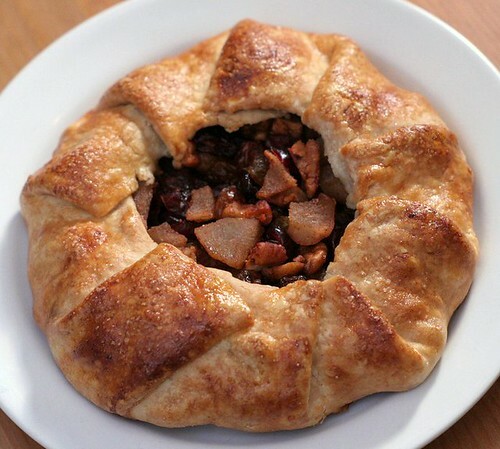 I wasn't thrilled with how the baked apples came out, but I loved the combination of flavors and textures that came from the dried fruit and nuts, and thought they would add a nice dimension to the galettes. These galettes came out so, so good! The pastry was flaky and crisp, even on the bottom of the galettes, and the fruit/nut filling had a fantastic blend of flavors and textures. I especially liked the way the tart dried cranberries worked with the sweet fruit and honey. I am never going to throw out pastry dough scraps again - in fact, I might make dough just to keep in the freezer for impromptu desserts like these! How have you been using fall fruit? This is a very adaptable recipe. You can change the dried fruit, spices, or nuts according to your preference, and can also adjust the size of the galettes if you have more or less dough around. Put a rack in the center of the oven and preheat to 400 deg F. Combine chopped pears with the dried fruit, nuts, honey, brown sugar, and spices, and mix well. Let fruit macerate for 20 minutes. When fruit is finished macerating, roll out the dough into a 9- or 10-inch round. Pile fruit mixture into the middle of the dough round, including any liquid that has collected, leaving a 1 1/2 inch border. Fold the border over the fruit, overlapping the edges as you go. Brush the crust with the beaten egg and sprinkle with sugar. Bake galette in the preheated oven for 30 minutes to allow crust to brown. 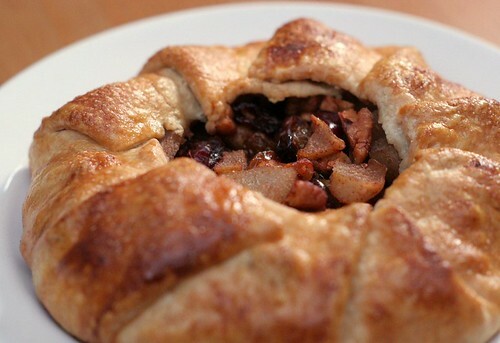 Cover galette with foil and continue baking for 15-20 more minutes, or until pears are tender. Galette is best served warm. What a perfect use of that extra dough! The filling to these sounds so lovely...fall in a pie crust! This looks incredible. Love the golden and sugar-topped crust! Admittedly I don't like to eat pears raw but cooked they are something else! I just had a whole dinner of pear dishes last night, and I realized I've never done anything with them besides eat them. 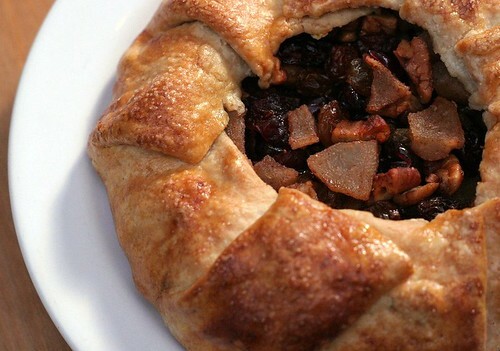 This galette sounds fabulous. I may have to make it. Megan - Let me know what you think if you try it. Shannon - I bet these would be great with apples too! My master's, a new job and baby leave me with little time! Should start soon.